After Apple announced support for an upcoming "Made for iPhone" (MFi) program supporting certified game controllers using new APIs in iOS 7, a report indicated that Logitech and MOGA were among the first wave of companies to be working closely with Apple on such accessories. Logitech's controller has been seen several times already, and now a photo of MOGA's offering has been leaked on Twitter by @evleaks. 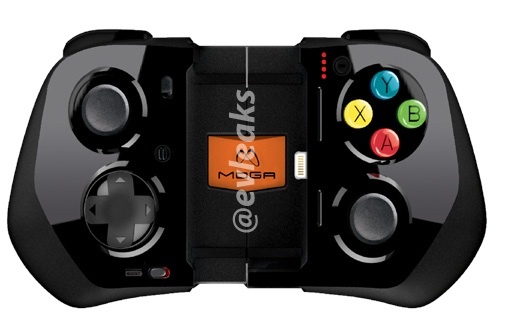 Apparently called the "MOGA Ace Power", the enclosure controller reportedly includes an integrated 1800 mAh battery and the photo reveals not only the traditional D-pad on the left front and buttons on the right front and shoulders of the device, but also dual thumbsticks on the left and right front. A second photo shows the controller in closed mode when the iPhone has been removed. Apple has yet to officially announce the launch of its MFi program for game controllers, but it is clear that third-party manufacturers are gearing up to launch their products. Companies such as ClamCase and Logitech have been teasing their offerings, suggesting that a launch may be rather close, but launch details for the devices have yet to be revealed. It will very shortly if they don't get their acts together better than they have been. Nintendo will turn into Sega if they aren't careful. Can't wait for the day to see actual gamepads.. will actually be able to play driving and fps games on the iphone for once! Just hope it will accommodate the iPhone 6 and its larger screen or its a no buy! Thank you for your confirmation that the iPhone 6 will have a larger screen, I was worried that I would have to find out through months of lurking in forums. Not only did you give me knowledge, you gave me, you gave me freedom. Looking forward to these devices being shipped. They are long overdue, should have been out two/three years ago. This isn't a question of being careful, this fight is done. No one is going to buy a portable gaming platform when the phone in their pocket is more powerful and now has a better controller attached to it. It will be the android devices and the iphones that win this war. Sony and Nintendo will have to drop their portable devices in two years. They won't be able to afford to do the R&D for a next generation version. Nintendo will at least be able to make software for the iPhone and make more money of it there than they would have on their hardware. So it isn't the end of them by any means. Really - get a grip on mobile gaming and stop regurgitating that Jobs/Schiller-fed-BS of "Apple is the #1 mobile gaming platform!" Why do these mfi controller news always end up into a Nintendo thread??? Stop it!